Feline hyperthyroidism is the most common endocrine disorder in middle-aged and older cats. It occurs in about 10% of cats over 10 years of age. Hyperthyroidism is a disease caused by an overactive thyroid gland that secretes excess thyroid hormone. Cats typically have two thyroid glands, one gland on each side of the neck. One or both glands may be affected. The excess thyroid hormone causes an overactive metabolism that stresses the heart, digestive tract, and many other organ systems. If your veterinarian diagnoses your cat with hyperthyroidism, your cat should receive some form of treatment to control the symptoms. Many cats who are diagnosed early can be treated successfully. When hyperthyroidism is left untreated, symptoms will progress leading to marked weight loss and serious complications due to damage to the cat’s heart, kidneys, and other organ systems. Routine screening of laboratory tests and blood pressure may detect abnormalities before clinical signs are advanced. Blood testing can reveal an elevation of thyroid hormones, which may lead to a hyperthyroidism diagnosis. Occasionally, additional testing may be required to confirm the diagnosis. Because hyperthyroidism can occur along with other medical conditions, and it affects other organs, a comprehensive screening of your cat’s heart, kidneys, and other organ systems is imperative. If your veterinarian diagnoses your cat with hyperthyroidism, he or she will discuss and recommend treatment options for your cat. Four common treatments for hyperthyroidism are available and each has advantages and disadvantages. 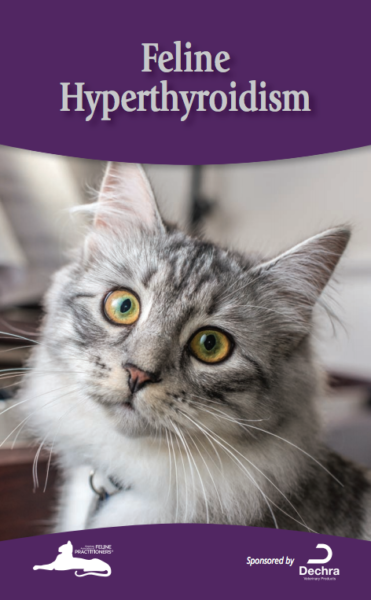 The choice of therapy can depend on factors such as your cat’s age, other disease conditions, treatment cost, availability of treatment options, and your veterinarian’s recommendation. Radioiodine therapy – commonly called I-131 by your veterinarian. This treatment consists of administering a small dose of radioactive iodine which only overactive thyroid tissue will absorb. The radiation destroys the abnormal cells while the normal thyroid tissue continues to function. Even though this radiation exposure carries minimal risks for you and your cat, special facilities are required for treatment, and specific isolation protocols need to be followed after discharge. The advantages of I-131 treatment are that it can be curative and there is no anesthesia, surgery, or risk of drug reaction. The disadvantage is that few facilities provide this therapy and referral to a specialized treatment center is often necessary. Medical therapy – antithyroid medications will control the disease and block the excess production of the thyroid hormone; however because this medication does not cure the disease, your cat must take it for her entire life. Your cat may also receive the drug as a short-term measure, prior to surgery or anesthesia, or if radioiodine therapy is not available right away. Advantages of medical therapy are a low initial cost, readily available treatment, and no hospitalization. Disadvantages include the need for medication, potential for adverse drug effects, and long-term costs of treatment. Thyroidectomy – a surgical technique which removes all or part of the thyroid gland. The advantage of surgery is that it can be curative and eliminate the need for life-long medication. The disadvantages of surgery are that your cat requires general anesthesia and not all cats are good surgical candidates. Additionally, varying complications of surgery may occur including damage to nerves and blood vessels of the neck, damage to the parathyroid gland function, and recurrence of hyperthyroidism as unrecognized tissue can be left behind by even the best surgeon. Nutritional therapy – involves feeding a special diet restricted in iodine content to control the production of thyroid hormones, which may manage some cases of hyperthyroidism. Advantages of dietary therapy include low initial costs and ease of treatment. Disadvantages include complicating factors if your cat has other diseases or conditions, takes other medications or supplements, or does not find the taste appealing; also long-term costs of feeding a prescription diet, and the challenges of feeding this diet in multi-cat households. In general, all cats with hyperthyroidism need some form of treatment. The goal of therapy is to restore normal thyroid function and minimize side effects of treatment without creating lower than normal levels of thyroid hormones (referred to as hypothyroidism). On-going monitoring of your cat after any treatment is very important, as well as routine checkups with your veterinarian. If you have any additional questions, concerns, or notice any sudden changes with your cat, contact your veterinarian immediately.